What is Infrared System ? Infrared designating those invisible rays just beyond the red end of the visible spectrum. Their waves are longer than those of the spectrum colours but shorter than radio eaves, and have a penetrating heating effect; used in cooking, photography etc. Infrared offers cycle times 50% to 75% shorter than convection heating. 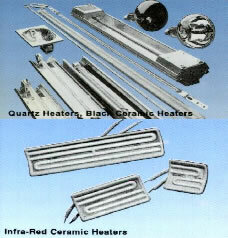 Infrared heating is highly efficient because the process heats only the product, not the surrounding air. Infrared energy is not absorbed by air and does not produce heat until it is absorbed by an object. Infrared offers higher heating rates, which means faster production using less floor space. Electrical infrared is an environmentally friendly process, with no ozone depleting or greenhouse gases released. Powder coatings and water-based paints are ideally suited for infrared, eliminating solvent-based process. Heat up times for infrared emitters in minimal, reducing energy coats. The equipment can be turned on minutes before production begins and turned off during breaks and lunch periods. Infrared ovens require less maintenance. On the average, electric infrared ovens are 3 times more efficient in delivering energy to the product than gas convection oven. With today infrared technology, complex shaped object as well as flat shapes, can be cured. Drying of metal after degreasing process. Drying of metal washing process. 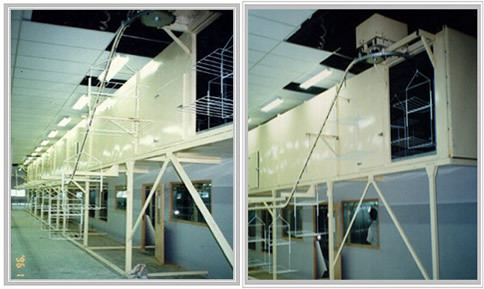 Curing of paint - wet paint & powder coating. Curing of ink - silk screening. Stress relief on metal fatigue. Curing of paint, both solvent and water based. Silk screening plastic products such as audio and video equipment, computer, handphone key switch etc. Varnish drying, curing of paint. Motor coil curing (after varnish).